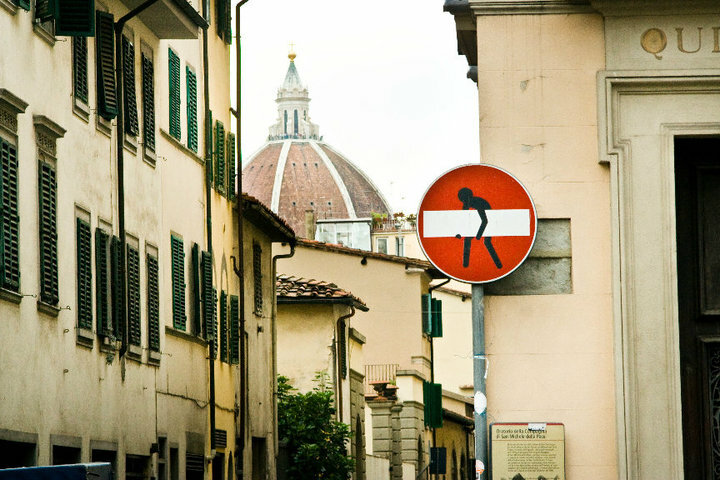 I finally discovered the author of these marvelous artistic street signs that I have been seeing around Florence: they are by Clet Abraham. A black silhouette sneakily carrying away the no-entry bar is what first caught my eye; later I also saw the crucified Christ on the dead-end sign. Clever, I thought, and made a mental note to photograph them and post them on this blog. The joys of facebook: someone in my vast network "liked" the fan page of the artist Clet which has as its logo the no-entry sign. At the same time, the lucky artist is seeing exposure in traditional media with an article in yesterday's Repubblica di Firenze. But for my English-speaking readers, I thought you'd enjoy finding out more about Clet's art so I wrote to him and asked him a few questions, which he very kindly answered right away. For the record, "Clet" in art is 43 year old Clet Abraham, a French artist who has been living in Italy for over 20 years. This "guerrilla" act of art is just one manifestation of his often surreal and colourful approach to the world. My street sign work stem from a reflection upon our “common visual space”. 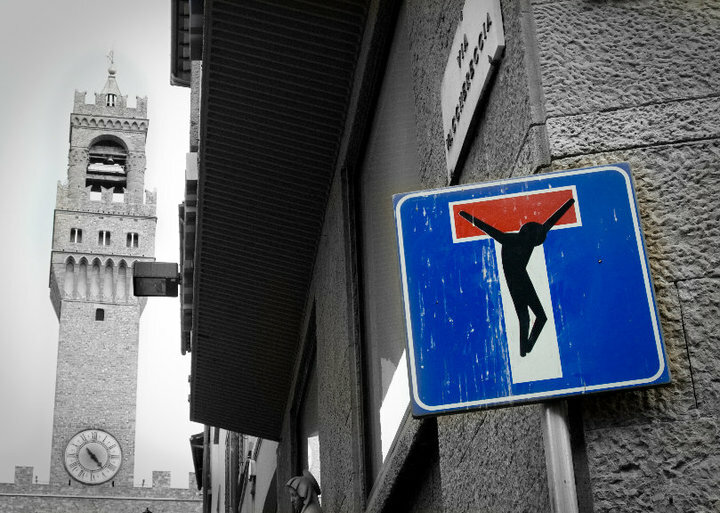 The omnipresence of street signs, other than being a sign of the [Italian] culture of “anti-responsibility”, can verge on the absurd. The message is very poor (sometimes I feel like I’m being treated like an idiot by them) and yet they have a highly invasive aesthetic. As a professional in the world of visual space, I feel called to intervene, both to notify the public of the absurdity of the situation, and to propose a constructive and respectful alternative. 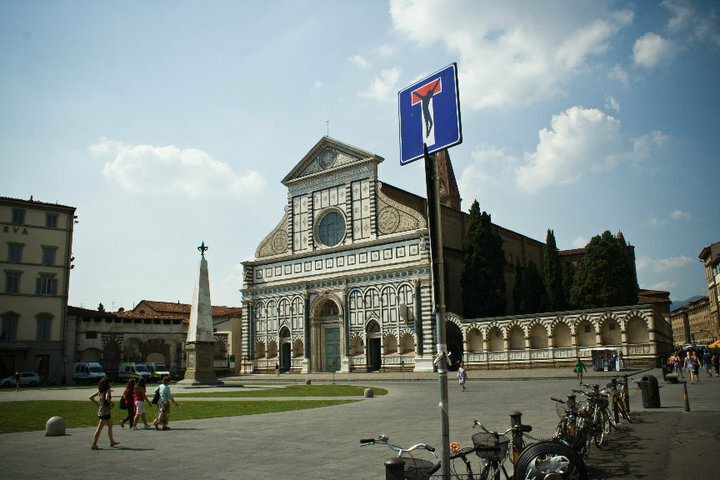 My adhesives are developed to add a further level of reading [to street signs] constructed on the base of their original signification in order to maintain its utility but give it some intellectual, spiritual, or simply amusing interest. The final objective? That traffic keeps flowing without us feeling spoken down to!" I’m not sure exactly what the fundamental difference is between a graffiti artist and my work. I can say for sure that my stickers are easily removable. It’s essential to me to create works that are in thematically in keeping with the support upon which I am working, to adapt myself thus to any situation with complete respect for the work of others; I try to offer a service with my talent and knowledge. It’s possible that some graffiti artists have a similar work ethic. We do have in common a taste for the mysteries of the night and of surprise; a healthy attitude [or preference] for liberty of expression and breaking of rules – but these are the bases of being an artist! See you soon again, Clet!